UNITED NATIONS, January 9 -- When video emerged in Haiti of UN peacekeepers from Uruguay abusing a teenaged boy, Uruguay sent the soldiers who appeared on film back to Montevideo, saying they would be prosecuted. UN Secretary General Ban Ki-moon applauded this and claimed again that the UN has a "zero tolerance policy" for abuse. But now the soldiers have been released in Uruguay, because predictably a prosecution far away from Haiti was unable or unwilling to get evidence from the victim and other witnesses in Haiti. On Monday Inner City Press asked Ban Ki-moon's spokesman Martin Nesirky if Ban now saw the flaw in leaving it entirely up to troop contributing countries to discipline UN peacekeepers accuse of abuse. Video here, from Minute 11. Nesirky replied that "you know... it is for national authorities to undertake investigation." He urged Inner City Press to "check with the Uruguayan authorities." But it's a UN question, and Inner City Press asked it again: now that even in a case that Ban praised the troop contributing country for its action, the accused are released based on a trial court far away being unable or unwilling to get evidence from the victim and other witnesses, will Ban seek to reform the system to ensure prosecution of wrongdoers in the jurisdiction of the alleged crime? Nesirky said, "it would be a matter for the member states." While Ban makes claims of zero tolerance, he is apparently not proposing any reform. And so it goes at the UN. 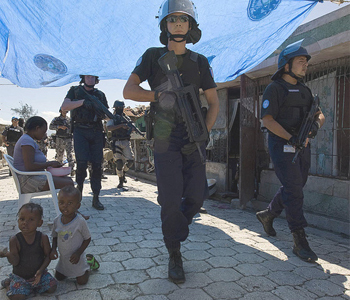 Meanwhile, there has been no further follow up answer to Nesirky's earlier response that abuse by other MINUSTAH peacekeepers in Fort Dimanche was being investigated, nor to repeated requests for the UN's response to the claim filed with it for compensation for allegedly introducing cholera onto Haiti. Various UN officials held a press teleconference call last week, hosted by the UN Foundation, that even discussed the cholera epidemic, without once acknowledging widespread and credible claim that cholera was introduced to the island by UN peacekeepers from Nepal. This UN seems to operate in a parallel universe, seeking not to engage the obvious flaws its supposed "zero tolerance" policy or its critics, or in this case victims. We will continue on this.